Sorry I’ve been AFK. I’ve dealt with health issues and a family crisis for the past few weeks, and I’m just now feeling like a productive member of society once more. Have some links and a look at the foods I’ve been eating lately. I stole this link from a friend, and I want to post it everywhere, ever: The Terrible Tragedy of the Healthy Eater. It is so easy to make yourself crazy with the self-imposed eating habits, keeping up with spurious blog claims, reading forums written by the self-righteous and condescending. Everybody, you have my permission to chill the eff out about your food and laugh at yourself. Funny recipe/life blog PaleOMG is always worth reading. Sometimes I just look at the pictures, sigh about how boring my life is in comparison, and then go on to the recipes. What I’ve been eating. Top left: grilled chicken, grilled bison burger with bleu cheese, sauteed asparagus, and pasta salad. Top right: My grocery haul, including all manner of seasonal fruit, squash, fresh veggies, and wine. Bottom left: dinner from last night was carrots, raw sliced mushrooms, and a cranberry trail mix. 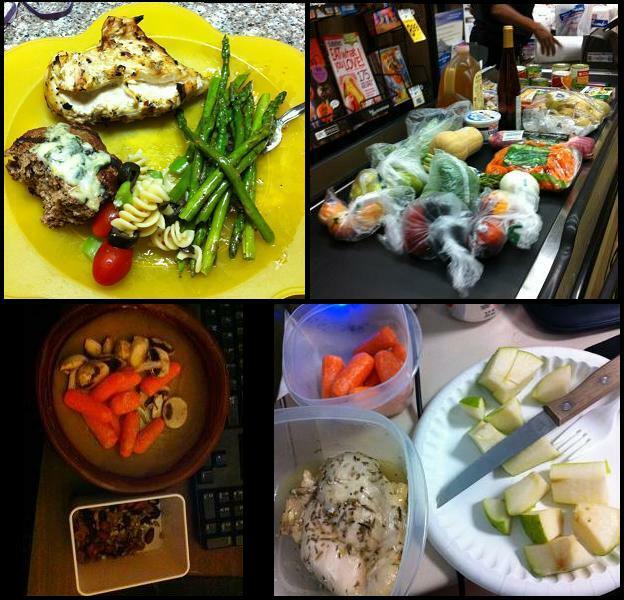 Bottom right: lunch from last week of raw carrots, baked chicken in rosemary and butter, and a diced Bartlett pear. Speaking of recipes, Rantings of an Amateur Chef regularly makes stuff that I would love to have on my plate. Step-by-step recipe photos, a wide ranges of food topics, daily posts, and plenty of variety make this a must-read for those whose palates would benefit from experiencing something new. And then, tooting my own horn as one of the team of moderators on Reddit’s 90 Days Goal community, here’s my Saturday post about seasonal food. I’ll be posting the daily posts on Saturdays. I think food is such a widely varied subject that it deserves all the talking about it can get, and I’ll be contributing to that conversation between mods and community members. This entry was posted in food, health and tagged anxiety, food, links, low carb, monday meals, paleo, vegetarian. Bookmark the permalink.